With its 139 facilities, Gwinnett County Public Schools (GCPS) is the largest public school system in Georgia—and one of the most diverse districts in the nation. Since September 2016, I've worked on a media leaders’ committee to find ways to utilize the books in our media centers during the summer. Our solution? The GCPS Book Mobile, a retrofitted school bus that has been rolling across our district since June 1. We analyzed data from the United Way to identify the areas in our county that would benefit most from this service and help prevent the "summer slide." We selected stops that don’t have public libraries nearby. 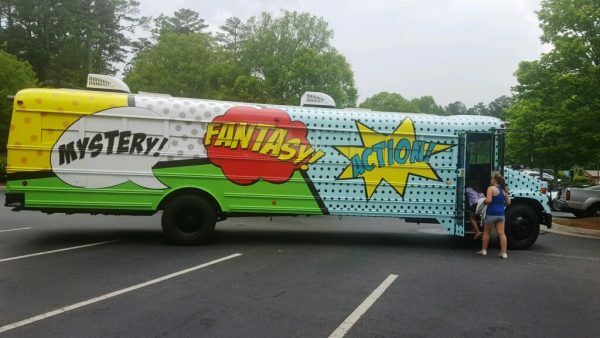 This up-cycled bus offered 5,000 books from Gwinnett’s elementary, middle, and high school media centers. The polka-dot vehicle traveled a 35-stop route over five days each week, with two media specialists on board who were paid by the district. They visited the same areas each week, so students could return books and check out additional titles. In its first seven weeks the bus made 245 stops and had 5,248 visitors who borrowed 7,607 books. The pop art-style exterior was designed by a member of the district media services team with graphic design skills. Funds for the $40,000 conversion, including shelving, flooring, air conditioning, and lighting, came from district funds and business partners and donations, and volunteer labor contributed to cost savings. In the fall, media specialists will be able to “book the bus” to visit their schools as an incentive for student reading programs. Through donations and sponsors, students will select a new book to keep at these events. Jan L. Wilson is a media specialist at Brookwood High School in Gwinnett County, GA. She was also 2016 Media Specialist of the Year for the state of Georgia. I'll admit, I may be a little biased, but I am so excited for our students and families in Gwinnett County! 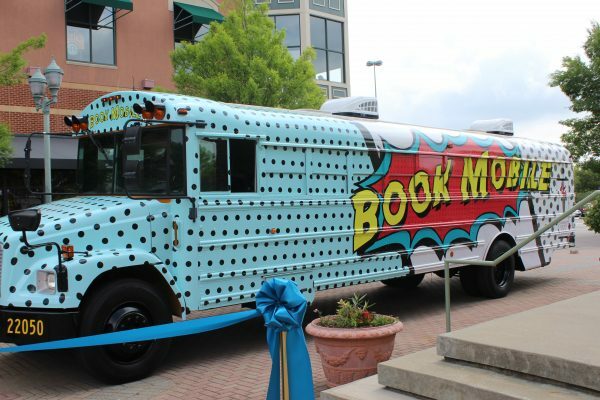 As an elementary level media specialist in Gwinnett county, I see that the "summer slide" is real, and the bookmobile bus will bring the excitement, and a lot of cool books, to our communities! I agree with Melanie. I am biased, but this is an amazing idea. The book mobile was very successful this summer. I hope to that it will be able to reach even more students next year. I own a Retired School Bus,I like the Black and Blue in the Front and the Orange and Yellow in the back. I think this is a great idea that you all have come up with for the Children.